(SKNIS): The flooding on Pond Road, which occurs during torrential rainfall, is expected to be reduced with the enhancement of the drainage system. 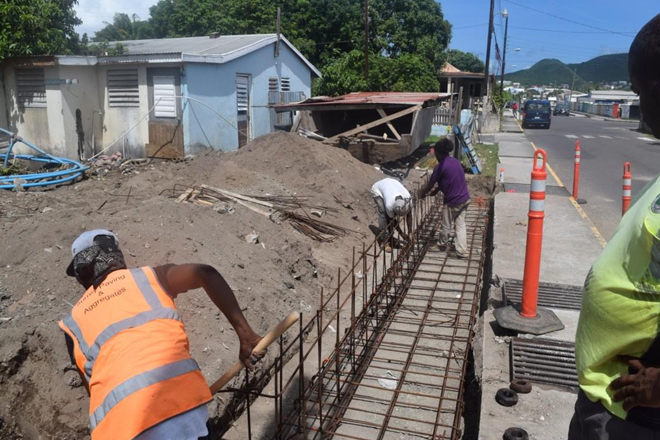 Crews from the Public Works Department (PWD) are busy repairing a section of the drain located at the corner of Pond and Sandown Road, as part of a component of a larger project that saw upgrades to the Basseterre Bay Road, Frigate Bay Road, and the Dr. Kennedy A. Simmonds Highway. Minister of Public Infrastructure, Honourable Ian Patches Liburd, said the drain has long been an issue and one which he promised to address upon assuming office. “The drain needed to be repaired because it harbored mosquitoes; there was a stench coming from it, and it [water] ran into people’s yards,” he said. Once the repairs are complete, Minister Liburd promised that the drain will be properly cleared as part of a second phase. Minister Liburd added that a third phase will see the addition of a drain down to Pitcairn Street at a later date. He said he was pleased that this project addresses the complaints from many residents and will help to improve the overall environment.